Last week, the biggest, most anticipated sports event of the year began in Moscow. 3.4 billion people across the globe, nearly half the world’s population, are expected to follow the tournament until the final game on the weekend of July 14th. This year more than ever, football fans will enjoy the games using a variety of devices often simultaneously: TVs, desktops, tablets and mobile phones. An impressive 25% of viewers are expected to watch the matches via digital platforms. At Streamroot, we’re thrilled to be delivering this mega event with several of the world’s major football hubs, prominent national and international broadcasters in Europe and Latin America including TF1, a leading French broadcaster and one of the biggest European players. Having successfully delivered twenty World Cup games during the first week, we’re happy to share some interesting stats on how our patented Distributed Network Architecture – Streamroot DNA™ – helps broadcasters ensure smooth, flawless streaming experience to millions of football fans around the world. A week and twenty games in, we’re proud to have delivered an impeccable football experience to over 4.3 million viewers. With traffic spikes of over 320,000 concurrent viewers per stream, Streamroot has increased its customers’ delivery capacity by over 10 times compared to their average traffic, providing the boost required for spiky World Cup traffic. 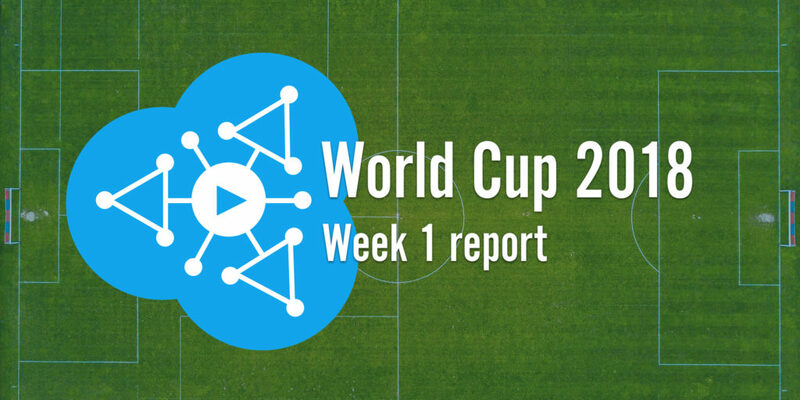 During the first week of World Cup 2018, Streamroot DNA™ delivered 72% of broadcasters’ traffic, impressively offloading up to 649 Gbps of bandwidth from traditional CDNs. That’s over 3.5 petabytes for one game. In addition to supplying the flexible capacity so critical for live streaming platforms that broadcast world-class sporting events, Streamroot also helps broadcasters improve the streaming quality. Streamroot DNA™ proprietary matching algorithms intelligently leverage user location, internet service provider, as well as network topology, device and bitrate to determine the fastest and most efficient connections for each and every viewer. Content multi-sourcing promotes a more efficient use of the network, safeguarding against server saturation and providing viewers with a better quality of experience even in areas where CDNs have fewer points of presence or infrastructure lacks. Viewers using Streamroot during the first week of World Cup 2018 experienced 11% less rebuffering in Europe, and 33% less rebuffering in LATAM. 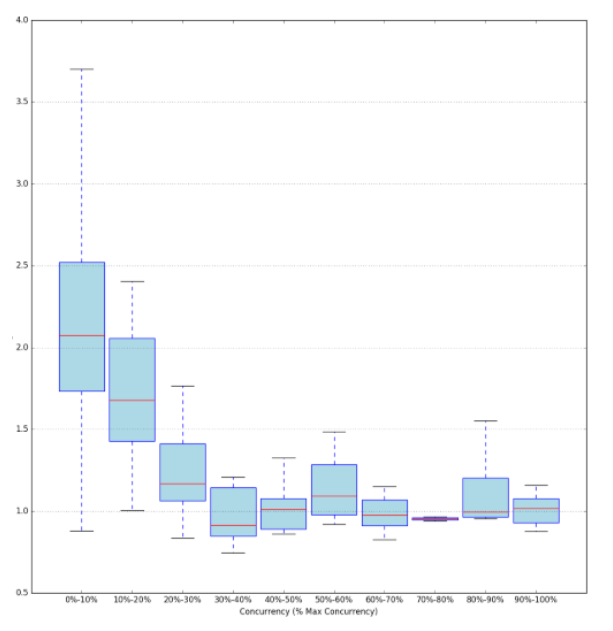 Our histogram below demonstrates another benefit of using peer-accelerated delivery. Unlike traditional CDN solutions, where viewer experience tends to deteriorate as more viewers connect and servers become saturated, with Streamroot quality improves as more viewers tune in. The more sources we have for distributed delivery, the stronger and more resilient the delivery network. As can be seen in the left part of the histogram, when the number of concurrent viewers is low – up to 10% of peak viewing – the median rebuffering ratio is 2.1%. Moving to the right, this number drops as more viewers tune in, reaching 1% median rebuffering ratio at peak viewing time – down by 52%. The typical game pattern of one of our customer’s World Cup streams below exemplifies the correlation between the number of concurrent viewers and rebuffering rate. In blue – concurrent viewers, in green – rebuffering ratio. Looking at the graph, you can see that as the number of viewers grows, the less buffering occurs. If you are wondering about the small spike at halftime, it actually comes from the player internals: the broadcasters replaces the world cup stream player by another ad player, making the stream player pause in the background, wait for the advertisement to complete, and register the break as a “false” buffering spike. World Cup 2018 is off to a great start, and we’re here to make sure that football fans everywhere continue to enjoy the games with a smooth live sport streaming experience. If you too would like to increase your delivery capacity and improve viewer experience at the same time, contact us for a free trial.